This book argues persuasively that a behavioral perspective offers the best foundation for strategic management scholarship. This book presents a focused approach to strategic management theory. 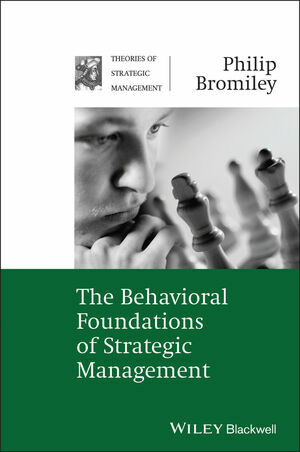 Outlines the basics of a behavioral approach to strategic management. Examines assumptions of rationality and equilibrium and the problems they create. Considers how a behavioral approach relates to a number of conventional approaches. Philip Bromiley holds the Curtis L. Carlson Chair in Strategic Management and is Chair of the Department of Strategic Management and Organization at the Carlson School of Management, University of Minnesota. Objectives of Strategic Management Research:. 2. Basics of A Behavioral Approach. The Ecological or Selection Argument. Two Criticisms of the Bounded Rationality View. 3. A Behavioral Critique of Rationality and Equilibrium. The Behavioral Critique of Rationality. Only Optimizers Survive – Selection. Correctness of Assumptions Doesn’t Matter because Optimization Predicts Well. Prediction is the Appropriate Test of a Theory. The Assumptions are Close Enough. Logical Problems of Rationality and Equilibrium. 4. A Behaviorist’s Perspective on Current Strategy Approaches. The RBV versus’ Porter’s Industry Analysis. 6. Where do we go from here?. Management Strategy and External Strategy. Behavioral Theory of the Firm. Argues that a behavioral perspective offers the best foundation for strategy scholarship.